By Kurian Maliel, M.D., Javed M. Nasir, M.D., Kevin Steel, D.O. The case presented is a 22-year-old United States Air Force Basic Military trainee who presented to the Emergency Department with atrial fibrillation with rapid ventricular rate. His rate was controlled with intravenous diltiazem and he spontaneously converted to normal sinus rhythm shortly after admission. He denies having similar palpitations in the past, but reports that he had developed chest discomfort and dyspnea during his military physical training activities. Prior to joining the military he indicates he was very sedentary. Review of systems were notable for only mild dysphagia with solid foods, although this was intermittent and he had never sought medical advice for this symptom before. His physical exam, electrocardiography (after spontaneous cardioversion), chest roentography, and transthoracic echocardiography were normal. Given exertional chest discomfort and dypsnea, he underwent a gated cardiac CT. This demonstrated normal coronary origins, but his left pulmonary artery took an anomalous course between the trachea and esophagus. This anomaly has been described in the literature as a pulmonary artery sling (PAS, Fig. 1) and was thought to be the etiology of his dysphagia and exertional dyspnea. Vascular rings are congenital anomalies that can present with a variety of pulmonary and gastroesophaeal symptoms. Patients will usually present with symptoms of airway obstruction due to tracheal compression manifesting as stridor, recurrent infections, wheezing, and cough. Esophageal complaints are also common and include dysphasia and vomiting. CT or magnetic resonance angiography is the preferred method of diagnosing vascular rings. Pulmonary artery sling is a rare vascular anomaly that is usually symptomatic within the first year of life. Symptoms are usually respiratory and/or gastro-esophageal and require surgical intervention. In patients with symptoms of dysphasia, barium esophagram can be used to exclude vascular ring. Asymptomatic presentation is less common and is usually found incidentally on CT or MRI. Asymptomatic patients typically have a good prognosis. Our patient had resolution of all his symptoms when he abstained from rigorous physical training exercises; he opted to separate from the military. Gaevecke H, Doehle H. Uber cineeltene angeborene anomalie der pulmonalarterie. Munch Med Wochenschr 1897;44:950-1. Sade RM, Rosenthal A, Fellows K, Castaneda AR. Pulmonary artery sling. J. Thorac. Cardiovasc. Surg. 1975;69:333-46. 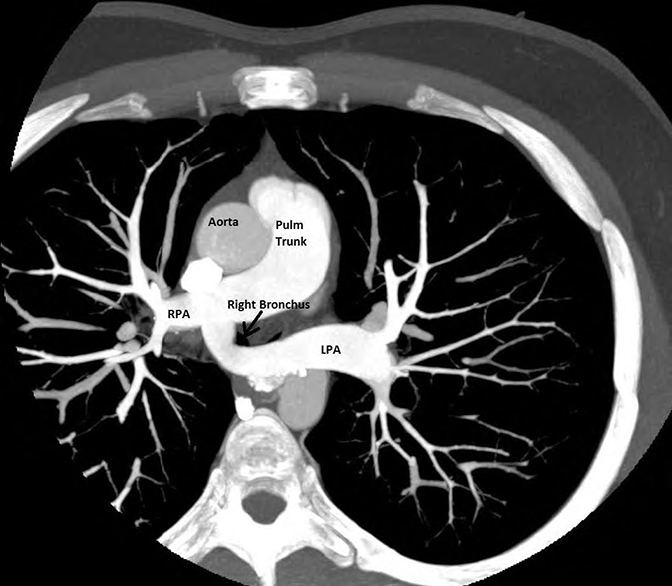 Goldstein BH, Bergersen L, Powell AJ, Graham DA, Bacha EA, Lang P. Long-term outcomes of surgically repaired unilateral anomalous pulmonary artery origin. Pediatr. Cardiol. 2010;31:944-51. Fiore AC, Brown J, Weber T, Turrentine M. Surgical treatment of pulmonary artery sling and tracheal stenosis. Ann Thoracic Surgery, 2005;79:38-46. Dupuis C, Vaksmann G, Pernot C, Gerard R, Martinez J, Van Egmond H. Asymptomatic form of Left Pulmonary Artery Sling. Am J Cardiol 1988;61:177-81. Backer CL, Ilbawi MN, Idriss FS and DeLeon SY. Vascular anomalies causing tracheoesophageal compression. Review of experience in children. J Thorac Cardiovasc Surg 1989;97:725-731. Hernanz-Schulman M. Vascular rings: a practical approach to imaging diagnosis. Pediatr Radiol. 2005 Oct; 35(10):961-79. Maliel K, Nasir JM, Steel K. Pulmonary Artery Sling Initially Presenting with Symptoms During Exercise. J Am Osteopath Coll Radiol. 2013;2(2):24-26. Kurian Maliel, M.D., Javed M. Nasir, M.D., Kevin Steel, D.O. Dr. Maliel works with the Department of Medicine, San Antonio Military Medical Center, San Antonio, TX; and Dr. Nasir and Dr. Steel work with the Department of Cardiology, San Antonio Military Medical Center, San Antonio, TX.